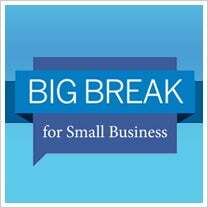 Everybody deserves a break, but American Express OPEN is now offering small business owners the ultimate Big Break. The credit-card issuer this week launched a national contest that will culminate with five winners each winging their way to Facebook headquarters in Palo Alto, Calif., for a two-day, all-expenses-paid social media marketing "makeover" and $20,000 to help grow their business. "The Facebook Big Break for Small Business" was designed to give small businesses the tools they need to maximize the potential of Facebook in order to connect and engage with existing customers and attract new prospects to their product or service. Winners and a business associate will each get one-on-one training, with tutors analyzing their current use of Facebook, as well as instruction on the benefits of using Facebook Pages, Ads and Social Plugins. The five winners will also "co-star" in these training sessions, which will be filmed and appear on AmEx OPEN’s Facebook Page and its OPEN Forum, an online resource for small business owners. Nearly half of small businesses claim to be using social networking sites to communicate with customers and market their products, and by far the most popular online site for such activity is Facebook, according to a 2011 survey from the American Express OPEN Small Business Monitor. A similar survey in 2009 showed that only 10 percent of small businesses used such sites to promote their goods or services. The competition is open to any Facebook member who is a legal resident of the U.S., is at least 18-years-old and who is the owner or co-owner of a small business with $10 million in annual revenue or less. To enter, visit AmEx's OPEN Facebook page by midnight Eastern Time on May 20, 2011, and fill out a short questionnaire asking you to describe how you would best use the winnings to better your business. The judges -- who include venture capitalist Guy Kawasaki and John Battelle, the founder and CEO of Federated Media Publishing -- will reduce the number of finalists to 10 after the first round of the competition. Criteria for getting to this point in the judging includes what the judges determine as your commitment to your business and growth, your energy and enthusiasm for small business and the overall social media need where Facebook could help your business. Those 10 finalists will then compete in a final round of judging where fans of OPEN on Facebook will vote for their top five favorites to receive the training and the $20,000 prize. How would your business utilize $20,000 and a one-on-one training session with Facebook? Leave a comment and let us know.